Y’all. I have been slogging away on my Florida Trail memoir for 2.5 years. I swore way back when I started it in August 2011 that it’d only take a year and since then I had several ambitious moments when I said “I’m gonna finish it by such and such time” and those times came and went. But finally two days ago I wrote the last sentence. Or, well, the last sentence of my first draft. I have a feeling I’ll be adding an epilogue and reworking the ending. In all, the first draft is 111,100 words long. I really didn’t go into our hike with the intention of writing a book, the same way I felt when we went on the AT. But, on the FT I ended up doing a voice diary on a small recorder on most nights, and after we got home I noticed that there were only a handful of memoir books—enough to count on one hand—about the Florida Trail. I knew I had to write it out, even if I had no idea what I was doing with writing and publishing. And here I am now with a bonafide first draft of a book. Next is to sit down and run through a first edit. That will involve the obvious reworking typos and grammar errors, but also formatting the book into chapters and coming up with titles for the chapters. For this first draft I wrote mostly from memory with assitance from my blog posts to jog things loose in a few areas. Now I’ll go through my voice recordings to figure out tidbits I missed and add those in if relevant and beneficial to the book. I am thinking of giving myself a deadline of two months to run through this draft so I can start sending queries out to publishers. I’m hoping the editing process is smoother and more entertaining than the writing part, but I’m sure that’ll backfire on me or something. In the world of the Florida Trail currently it seems this year is a banner year for Florida Trail thru-hikers and section hikers. Sandra Friend at Florida Hikes recently posted, I think it was 43 or 46, hikers currently out on some section of the FT. I can’t find that post to verify those numbers, but it is an awesome number! She also linked to some of their journals which you can peruse. I’ve been following Acorn and Rainbow on Facebook as well as Balls of Balls and Sunshine fame. I’ve been really enjoying seeing their updates and getting their impressions of the trail. Rainbow has hiked the FT several years in a row now, and we met her when we hiked in 2011. I’ve really appreciated her perspective but maybe that’s because she’s used to Florida and knows what to expect. On a follow up note, when I wrote my treatise on the Florida Trail earlier this month, I was nervous about hitting ‘Publish’. Was I going to be ranting to the web with no input? Was I completely insane for my viewpoints? It was nerve wracking. Or maybe I just over think things….quite the possibility. However, I was thrilled with the reception it got. There were some excellent comments from several people on the post itself and then through several other Florida Trail hikers and supporters on Facebook, whom also shared the post in their feed. A couple folks on Twitter re-tweeted it. I got the attention of Carlos Schomaker, the Florida Trail Association president, who sent me a message reaching out to connect sometime about my views. (Still need to do that!) And then things simmered for a few days until I got a comment from PMags one of the hosts of the The Trail Show, the podcast I’d mentioned in my write-up. 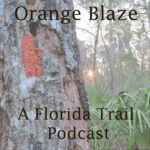 We conversed a bit via email and before I knew it I was invited to be on their February podcast to help showcase the Florida Trail as their ‘Trail O’ Da Month’. Whaattt? So, yeah, I’m totally committed now, especially since they mentioned my post on their January show and told the hiking world I was going to be on the show! It looks like we’ll be recording sometime in late February so as soon as the podcast is up I’ll share the link so you all can listen! I’ll be thinking of some sweet things to say about the FT over the next few weeks. If you have any questions that you want me to address, send them on and I’ll try to weave in the information on the podcast. In all, I think the Florida Trail has a good future despite some issues it might be facing now. In other trail news, y’all should follow Joan on her first thru-hike, this one being the PCT! I’m so excited for her! Then, there’s the Tougas family, a family of five who will be thru-hiking the AT this spring. Should be two interesting hikes to follow! I heard the announcement on the Trail Show that you would be interviewed about the FT next episode- that is so cool!!! WOW! Can’t wait to hear! OMG, I couldn’t be more excited for you! I think you learned so much in this process and it will be invaluable for the next book you write 😉 Fingers crossed for the the editing/publishing part. Great job on the reach you got with your FT post too. Looking forward to having you on! …and if this cold snap keeps up through-out the country, the FT looks better and better!